Located in a natural, serene environment, our main campus at Etta offers the perfect place for you to begin your recovery. 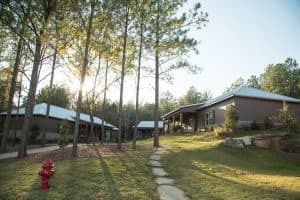 You can fully relax in our rustic cabins with two beds per room and semi-private shared bathrooms (one per shared room). Addiction can take a major toll on your body. We encourage you to use our fitness center to begin regaining your physical strength and confidence. Working out can make you feel better emotionally, as well! Our fully-stocked fitness center allows you to can keep up with or begin new exercise routines while in treatment. Our executive chef will prepare delicious, balanced meals that will help you to address nutritional deficiencies that often result from consistent substance use. Our chef will prepare your meals using the finest ingredients and can accommodate most dietary restrictions. Art therapy. We employ dedicated art therapists in order to provide our patients with a well-rounded and holistic therapy program. Artistic expression is a healthy way to work through your emotions that you can continue once you leave Oxford. Music therapy. Music is one of the oldest forms of communication, and it can be a great pastime or hobby. Our music therapy program, in addition to being a great holistic therapy to supplement your treatment, can also be a great way to spend an afternoon. Yoga. At Oxford, we offer yoga classes as a way to bring your focus inward while learning to connect your body and breath. Mindfulness. Mindfulness and meditation practices are offered as a way to help patients calm the mind and reflect. 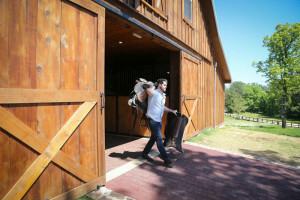 Mainly used for equine therapy, we maintain an equestrian center, staffed by equine therapy and caretaker specialists on Oxford’s campus grounds. If you choose to participate in equine therapy, you’ll have the opportunity to begin learning how to ride on horseback, and even go on proctored rides on our riding trails. 12-Step walk. The 12-Steps are one of the oldest forms of addiction treatment and call for both group sharing and individual reflection. Our scenic 12-Step walk will allow you a chance to reflect on 12-Step teachings in the serenity of nature. Ropes course. Part of our recreational therapy program, our ropes course can help build confidence while also providing a good workout. Addiction often leads to isolation and a disconnection from previously loved hobbies. We offer many opportunities for patients to engage in fun, sober activities where they can connect with their peers and regain a sense of community. Sand volleyball court. Our sand volleyball court is open year-round, weather permitting. Basketball court. We encourage patients to get outside and enjoy a game on our basketball court. Private lake. Oxford has its own private lake. While it may be frozen in the winter, during the other season you’ll be free to walk alongside it or lounge on its banks. Labyrinth. Our labyrinth is generally part of our recreational therapy, but can be explored during one’s free-time. Gardening. Generally active during the spring and summer, our gardening program will have you outside, working with your hands, and growing various plants, flowers, and vegetables. Fishing. You can enjoy fishing on our private lake during the spring, summer, and autumn months.